Hiking the rim to rim trail, as described, is the recommended route for several reasons. Hiking from the higher North Rim to the South Rim means less of an uphill climb at the end of the trail and choosing the Bright Angel Trail over the South Kaibab Trail means more shade to hike in and the opportunity to fill up on water. The North Kaibab trailhead is a lofty 8200', while the Bright Angel trailhead is at about 6800'. Day Hike: Not recommended. This trail is best done as a three day hike. Do not attempt to hike down to the river and back in one day. Average Hiking Time: 3 days. Trail Conditions: This trail is hot in the summer. Consider hiking in the spring and fall. The path is sandy and wide in most places and well maintained. The trail is easy to walk on, but is often in full sun. Mules use this trail heavily! There are telephone poles, water pipes, ranger homes and mule waste along this trail. If you are looking for a pristine and primitive trail this is not it. On the other hand there is the convenience of water, restrooms, food and lodging along the trail. Trail Access: Note North Rim winter closures. Water Availability: Seasonal - Check with backcountry office before starting hike. Restrooms: Yes, throughout the hike. Important Note: While the South Rim services and roads stay open year round that is not the case for the North Rim. Services are open from mid-May to mid October. The trails are open as long as you can get to the park. Highway 67 will close each year when the snow levels become too high to keep it open. This can be anytime after Thanksgiving depending on the weather and then the road will remain closed until mid-May. ADOT does make every effort to keep hwy 67 open until Thanksgiving. The shuttle does not service the North Rim year round, but large groups can rent the shuttle for a while after the North Rim services close. Canyon Coaches (928.638.0281) or the Trans-Canyon Shuttle (928.638.2820). Water sources along the rim to rim trail are shut down at certain times of the year. Contact the backcountry office prior to your hike. Water availability is also posted at the campgrounds and trailheads, but it is not updated every day. When hiking from the North Rim of the Grand Canyon to the South Rim this is where hikers cross. The North Kaibab Trail: Starting Elevation 8250'. It's 14.5 miles (Trailhead to Bright Angel Campground) and a 5841'. descent. The North Kaibab Trail begins by winding down a steep trail through a high alpine forest of aspen, Douglas fir and ponderosa pine. Hiking the trail after the mule rides quit for the season is ideal. Coconino Overlook: The Coconino Overlook is only .75 miles and 500' below the rim. This area is a showcase of coconino sandstone where students are taken to see the fault and the many layers of rock that are visible. The red rocks seen are the Supai formation. The Coconino Overlook gives a nice view of Roaring Springs Canyon. Supai Tunnel: Switchbacks twist and turn through Roaring Springs Canyon. A good day hike would end at the Supai Tunnel. At this point the hike is 1.8 miles and the elevation is 6800'. At Supai Tunnel there is an unreliable fresh water source and restrooms. The Supai formation are the red rocks visible from the trail above. Roaring Springs: After passing through the small man-made Supai Tunnel, imposing cliffs come into view. Pinyon's and junipers become dominant. The Red Wall Bridge is a popular resting spot before heading down the cliff hugging trail ahead. The formations now are Redwall Limestone, Muav Limestone, Bright Angel Shale and Tapeats Sandstone. Almost 5 miles down the trail is Roaring Springs. (4.7 miles) At this point you will have descended 3041'. The off-shoot trail to Roaring Springs is .25 miles. There is fresh water and restrooms there. The elevation is 5200' at Roaring Springs. Cottonwood Campground: Before getting to the campground you will pass by the Bruce's house, the pump house operator. (Water and an emergency phone are available at the ranger residence and the pump house. The trail follows the eastern side of Bright Angel Canyon for .25 miles to the Cottonwood Campground. At this point you have hiked 6.9 miles and the elevation is only 4000'. The forest gives way to yucca and prickly pear cactus. There is fresh water, (restrooms and camping) here. Look for the round Oza Butte and Bright Angel Point from the Cottonwood Campground. The trail now follows the eastern side of Bright Angel Creek. a half-mile from the Cottonwood Campground the trail crosses Wall Creek. This is the easiest day of the hike. Ribbon Falls: Ribbon Falls is 1 mile from Cottonwood Campground and a must do .25 mile side trail. This beautiful 100'. waterfall resembles ribbons blowing in the breeze, which is how it got its name. A unique moss covered cone takes center stage as the water beats down on the soft green mat of moss. Maidenhair fern, golden columbine and scarlet monkey flowers take advantage of the cool wet location. Return on the same trail hiked in on to go back to the North Kaibab Trail. The trail leading the other direction is difficult to follow. The elevation at Ribbon Falls is 3720'. The Box: Back on the North Kaibab Trail, the switchbacks ascend 1.5 miles along Bright Angel Creek. The next section is a swampy area which is a refreshing change since it's a shady and cool section of the hike. Soon the walls of Bright Angel Canyon close in to form what is called "The Box". This is a 4 mile corridor with 1000'. walls of vishnu schist and oroaster granite. There are four bridges that cross back and forth across the canyon. Leaving the Box, the land opens up for the next .75 mile hike to Phantom Ranch. Bright Angel Creek is a treatable water source. The creek was given its name in contrast to Dirty Devil Creek. Phantom Ranch: Walking through the Phantom Ranch area is about .5 miles of the hike. To eat or stay at the ranch you must reserve (303.297.2757) a meal or room, but there are candy bars, drinks and other snacks that can be purchased. If you want a Phantom Ranch T-shirt bring some extra money or a credit card. The ranger station and ranger bunkhouse are also along this section of the trail. After the trail leaves Phantom Ranch, it passes the Bright Angel Campground. (camping, restrooms, fresh water) There are seasonal ranger programs at the campground. At this point you have hiked14.4 miles from the top of North Rim. The elevation at the campground is 2480'. Colorado River: After leaving all the man made construction, the trail returns to the welcome site of nature. The Colorado River (elevation 2400') is .25 miles from Bright Angel Campground. Cross the Colorado River on Silver Bridge. On the other side of the bridge are some Ancestral Puebloan Ruins and the Black Bridge that crosses the Colorado River. The Colorado River is 14 miles and a 5500' elevation drop from the North Rim. The River Trail: The River Trail runs above the Colorado River and has little in the way of harsh elevation change. Part of the trail has deep sand and this section of the rim to rim hike has some of the most spectacular scenery. The River Trail is 1.7 miles long and ends at the river rest house (emergency phone) and the Bright Angel Trail begins. Bright Angel Trail: Start of Bright Angel Trail is at the river rest house The trail begins a steady uphill climb following and crossing Garden Creek. The Devils Corkscrew is a 200'. ascent from the bottom of the canyon that switchbacks through vishnu schist. Keep your eyes open for a cascade of water about a mile from the Indian Gardens rest stop and campground. The trail gets steeper and continues to the right of Garden Creek. The mules use this section of the trail heavily. The Bright Angel Trail is 9.6 miles long with a 4460'. elevation change. Indian Gardens: Indian Gardens offers fresh water, restrooms, camping and a ranger station with emergency phone and medical supplies. This is also where the mules will stop and rest. It is unlikely that you will escape the mules (or at least their droppings) from this point until the 3 mile rest house. The bright angel shale here forms the Tonto Platform. Climbing up to the South Rim: From here you are looking at hiking up 3000' in the next 4.5 miles. The trek is steep. Jacobs Ladder climbs, switchbacking, as it ascends. The 3 Mile rest house offers fresh water, emergency phone and from this point there is 2000' to climb in the next 3 miles. There is a short trail behind the rest house that leads to the remains of an old cable car system and some nice views of the canyon. At 2 Mile Corner there are pictographs nearby beneath a overhanging boulder that you must look for if you want to see them. The 1.5 mile rest house offers fresh water, a restroom, and an emergency phone. If you are wearing a backpack the trail at this point will feel extremely steep. There are two man-made tunnels along the next section of the trail that are carved in the Kaibab limestone. Look for some more pictographs just before the tunnel. Best Trail Features: The Colorado River, Ribbon Falls, the changing mountain scenes. The Trail: The Bright Angel Trail was historically a route used by the Havasupai Indians. 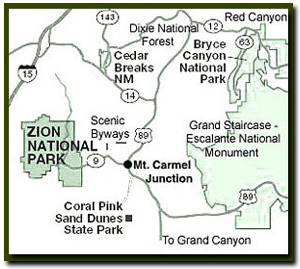 Options: There are several trails to explore while hiking rim-to-rim. There are short trails to Roaring Springs and Ribbon Falls and from Indian Springs you can take the 1.5 mile (one way) trail to Plateau Point, but be sure not to get on the long Tonto Trail by mistake. The view of the Colorado River from here is well worth the hike.